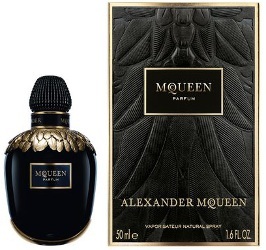 Alexander McQueen will launch McQueen Parfum, a new fragrance for women, next month. It is the brand's first release since 2007's MyQueen Light Mist. McQueen passed away in 2010. McQueen has created a unique scent, one that gives strength to your imagination. It is made from the precious essence of three night-blooming flowers, a parfum that unfolds the mysterious power in you. Uniquely McQueen. 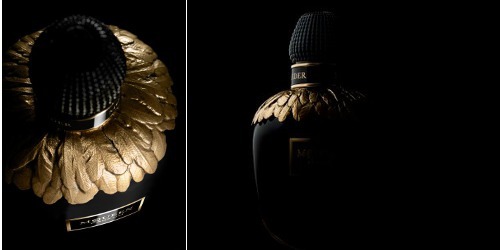 The notes include jasmine, tuberose and ylang ylang; the gold-feathered bottle is described as "a poem in glass". If it looks like that in person, I want one. Me too. I hope this fragrance lives up to the old McQueens, but I’m going to do my best to prepare myself for disappointment. OTOH, If it’s decent stuff that bottle may tip me over the edge. I hope so too. Their license has moved since the old ones, and obviously, McQueen himself is no longer involved, so we’ll see. Mm mm, it looks gorgeous! Wow, that is one gorgeous bottle! Hope the scent is as good…I really loved Kingdom and of course I could kick myself for not appreciating how great it was and buying a bottle. I used to frequent Sephora in Soho (the original US location not long after it first opened! I remember how thrilled we all were that it had finally opened stateside, wow that seems so long ago ha ha) and spritz some on during my lunch hour, but somehow I never gave in and bought it. And now, of course, if you can find it at all it goes for a fortune. Anyway – looking forward to this and keeping fingers crossed that it will be true to the edgy, irreverent McQueen style and not dumbed-down. Yeah. Long time since anyone released anything mainstream that was as edgy as Kingdom. Realistic jasmine in perfume is my great white whale. Still haven’t found what I’m looking for. Could this be the one? I’ll stop, I’ve run out of clichés. In any case, I love ylang-ylang. And that bottle screams “fetish object” in the best possible way. Only flowers? I’d had expected something a little more subersive. Still, it seems heads along he first insipid MyQueen. Sounds good to me and the bottle is lovely. Looking forward to sniffing. I’ve seen the bottle and can honestly say its beautiful. The fragrance is stunning – unfortunately the pricing is ‘not quite right’ in my opinion. There is a Parfum (shown in photo) which is being launched before the EDP (White bottle, no feathering) and the pricing between them is quite vast. Yo mama, which one is it then on offer at Harrod’s now? The picture shows the black bottle, the caption says EdP, the price is GBP 285, which is a bit stiff, I think. Well, here I go replying to myself: this seems to be the perfume concentration, 50 mls of it, at GBP 285 or EUR 350 (see McQueen homepage). Yes, the one at Harrods is parfum. The EdP will not be in this bottle, apparently.